Si Barron is a folk singer, songwriter, superb self-taught musician based in Devon. He has a deep relationship with English traditional music and a gift for turning time-honoured melodies into foot stomping anthems on guitar, dulcimer or pedal organ. Ros Brady is a song-writer, musician, actor and author. Her recent work has lead her to write songs through conversations with Jonathon Porrit, Director of Forum for the Future, Vandana Shiva of ‘Earth Democracy’ and Patrick Holden, Director of the Sustainable Food Trust. In her songwriting she has developed a technique similar to that of the work of Ewan McColl. McColl and Peggy Seeger composed lyrics in the 1970’s with the fishermen of the North East for their BBC Radio Ballads series. Barron Brady comprising Ros Brady and Si Barron are contemporary songwriters and interpreters of traditional English folk song. They live in Devon and perform nationwide. They have a dynamic acoustic style combining joy and verve in performance with an assured stage presence garnered from five years of performing nationwide. Simon’s ballistic fingerstyle guitar complemented by Rosalind’s harmonium and whistles underlines their harmony singing. "These two artists demonstrate most clearly in their work the relevance of an old tradition expertly employed to reflect a modern world, appealing to both the intellect and the heart." 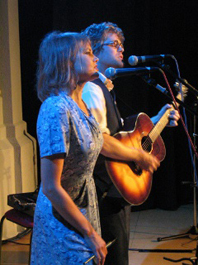 Si and Ros have been writing and touring as the folk duo Barronbrady for ten years and have released three albums during that time.